3 EASY MEALS FOR HEALTHY FAMILIES ON THE GO! Between school, work, sports & activities, families these days are busy. Really busy. Especially around dinner time! We know that every parent needs a few good recipes under his or her belt that can be pulled out in a pinch and don’t overwhelm the schedule. These on-the-go flash-prep meals can be healthy and nutritious when made with quality ingredients. The Little Creek Dressing website has lots of great recipes, but we went out on a limb and created our own. You are going to want to try them all! In these recipes we used Original, classic Okanagan Caesar and Asian Apricot but we also loved ​tantalizing Spicy Strawberry, and delightful ​Cherry Balsamic. 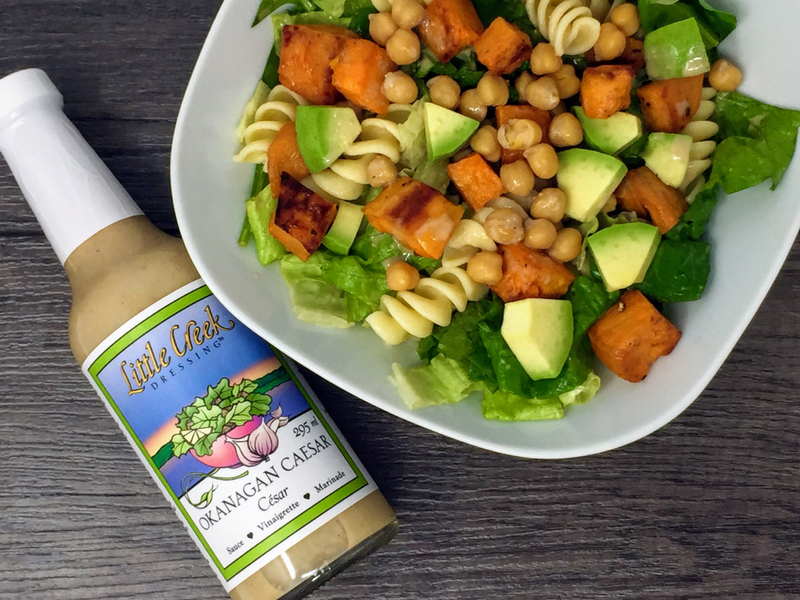 You can find out all about these amazing dairy free & vegan dressings here. 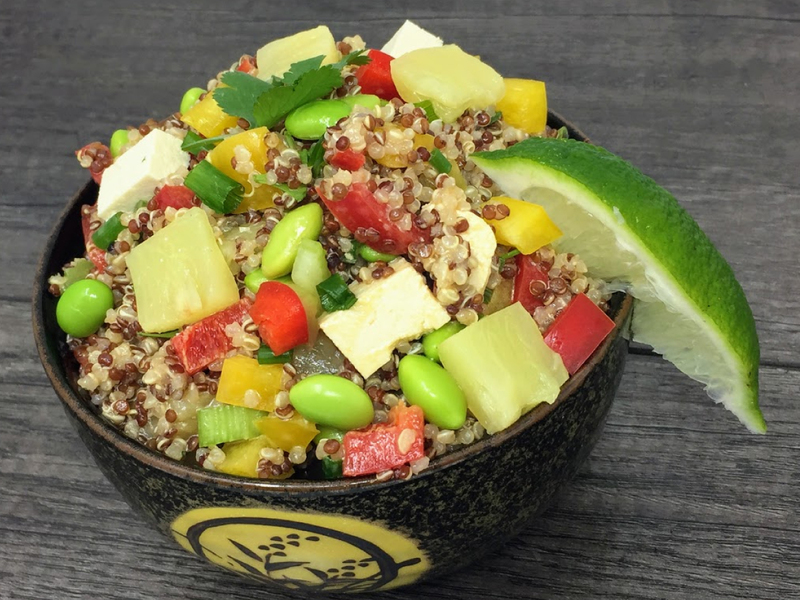 We love that this recipe adapts to whatever you family likes and also offers a great way to clear out the veggie crisper! Waste not, want not! 1 cup of chicken or other protein per person (there are 3 of us so we used 3 chicken breasts). 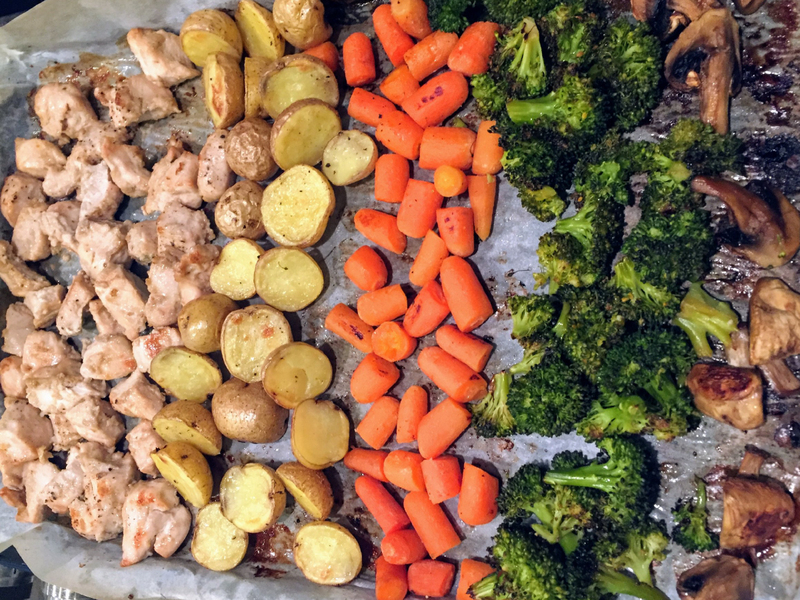 Place the chicken and veggies on a parchment-lined baking sheet separated so there is enough room to cook evenly. We arrange the veggies in order of cooking time so that we can easily remove some as they cook. Drizzle veggies with the olive oil & toss gently. Bake for 25- 30 minutes or until the veggies are charred & tender and the chicken is cooked. If you wish , you can remove the veggies as they cook and place in a covered dish to keep warm. 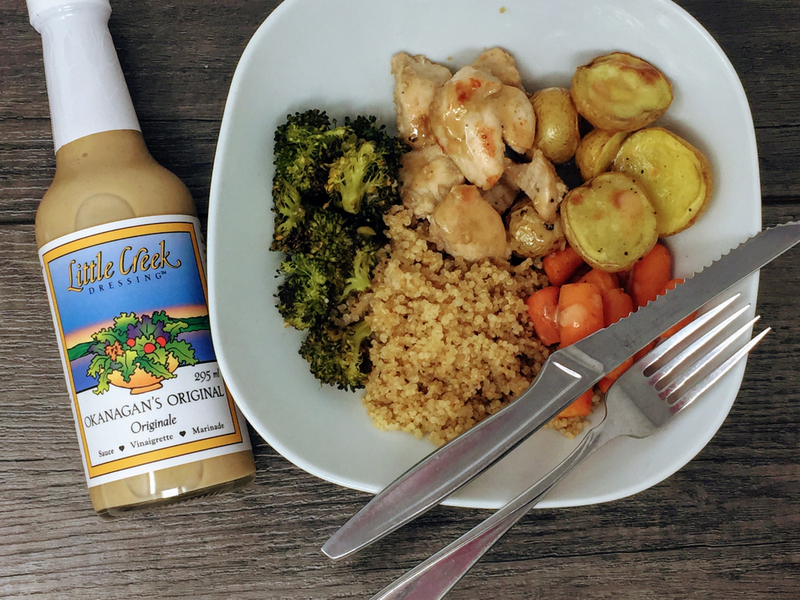 Serve chicken & veggies in a bowl drizzled with Little Creek Original Okanagan dressing with ½ to 1 cup of cooked rice or grain of your choice. YUM! This meal is quick to pull together on a busy weeknight – especially if the sweet potatoes are roasted earlier. For family fun, we let each person choose their own toppings and add the option of a cooked protein of their choice. On a busy night with competing schedules this meal can come together quickly and makes sure that everyone has nutritious meal made with love! 1 can chickpeas (14 oz), drained & rinsed. 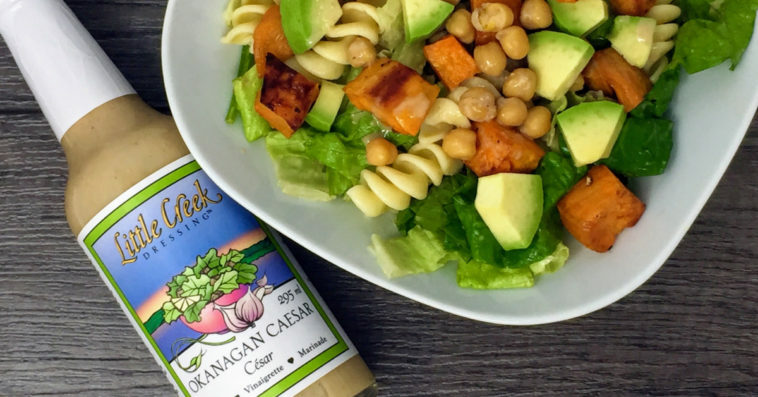 In a large bowl toss the lettuce with the Okanagan Caesar dressing and serve in individual bowls. Top with sweet potatoes, chickpeas, avocado & another drizzle of dressing. Optional: add cooked protein such as chicken, tofu, or tempeh. Preheat your oven to 400° F. Line a baking sheet with parchment or foil. Wash sweet potatoes and dice into small pieces (about 1 inch). Whether you peel them is completely up to you! In a large bowl, toss sweet potato cubes with 1 tbsp of olive oil and and a pinch of salt & pepper. Spread evenly onto a lined baking sheet. Roast potatoes for approximately 40 minutes, stirring every 10- 15 minutes or so, until done. They should be soft inside but crispy outside. Fun Fact: One 1/2 cup serving of sweet potato cubes provides over 100% of your daily vitamin A! 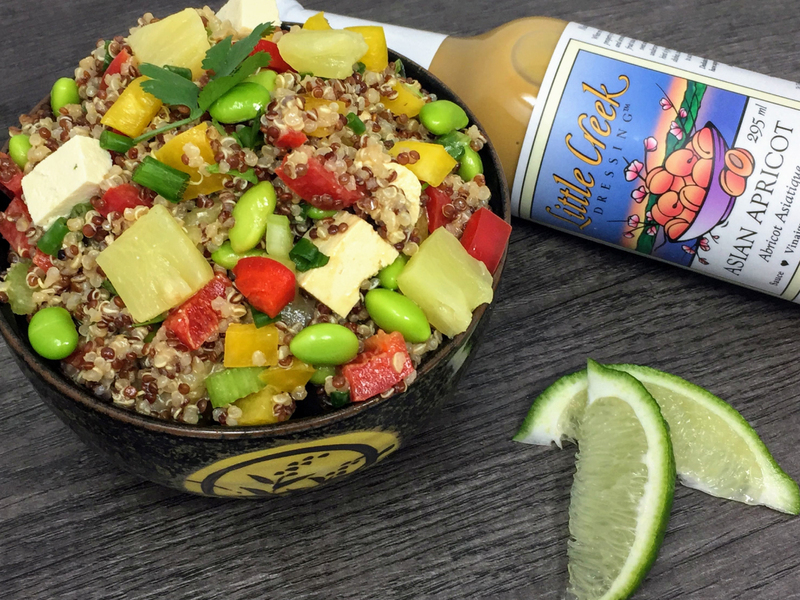 A perfect blend of earthy flavours of sesame & soy from the Asian Apricot dressing, sweetness from the pineapple and a kick from the lime. This meal comes together in a flash and is a great make-ahead lunch box filler or quick-grab dinner from the fridge, and it will wow the crowd at any group gathering. We used frozen shelled edamame that were microwaved for a minute, or you could steam them if you prefer. Mix all ingredients in a large bowl with dressing. Serve. This makes a great lunch and holds well in the fridge for up to 2 days. Recipe can easily be adapted to suit your tastes and is easily doubled or tripled for a big batch. Pour into a pan and add double the amount of salted water. Reduce to a simmer for 15 minutes, or until tender and the liquid is absorbed. 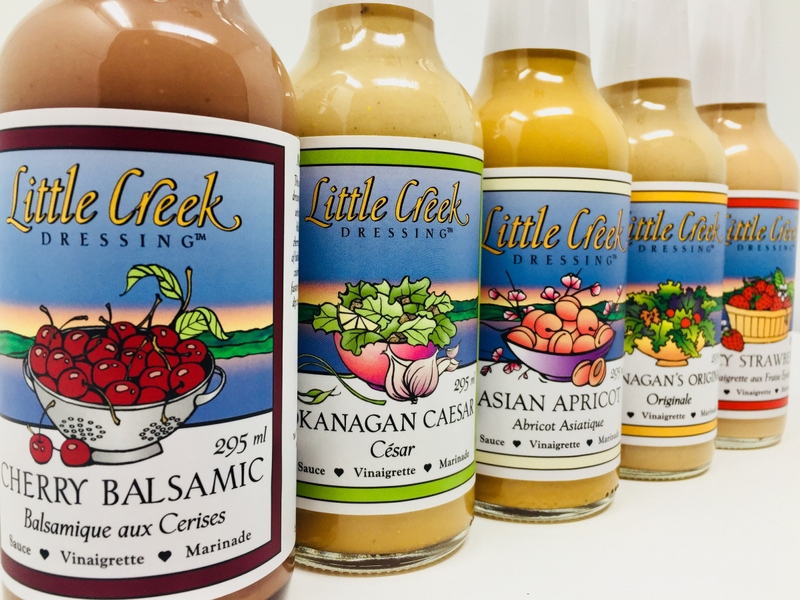 To learn more about Little Creek Dressing, visit their website at www.littlecreekdressing.com, or connect with them on Facebook or Instagram! You can buy their products at all major grocery stores across British Columbia, including Whole Foods Market. 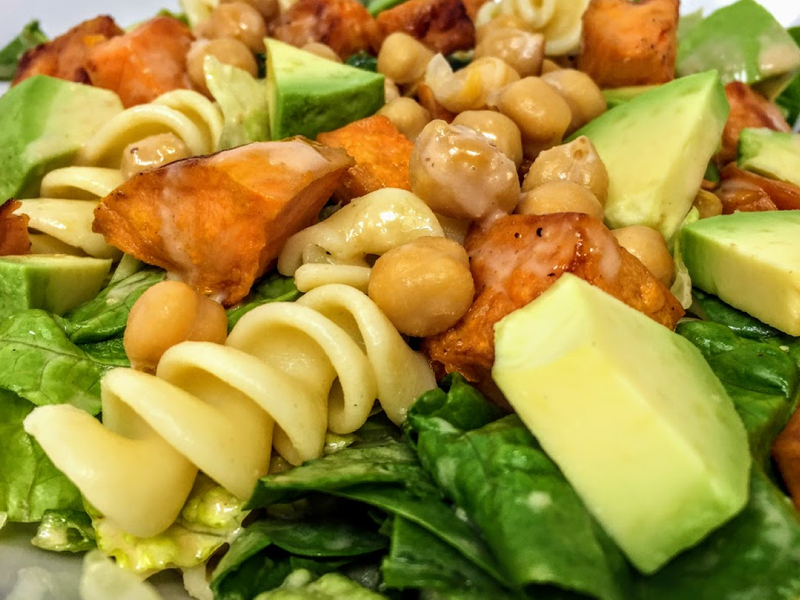 Would love to try the Roasted Sweet Potato Caesar Salad with Rotini, Chickpeas & Avocado recipe. I love all these healthy recipes! Your dips & dressings book is seriously one of my main go-tos for my dinner salads! So many great choices and I love how there are lots of ethnic recipes like Thai curry sauces, Asian sauces, etc. I really do feel my best eating high raw, although I do still like to include steamed veggies. I’d recommend your book to anyone.